I have to admit that I am always smitten by the underdog rescues. The ones that can test your meddle, but heap you with such passionate rewards. The first time I saw photos of Gülümser*, I was in love with her. They just came from somewhere inside my heart as I looked at her on my computer screen from thousands of miles away. The damages she suffered on the outside were extraordinary, but the message in her eyes transcended them. I could see such strength in her character and a curious, gentle personality glowing through her horribly disfigured face. She had been devoured by worms when she was just four weeks old. The vets treating her decided that if SHE wanted to fight back, she would be given every chance to survive. And survive she did! I featured her in a post a few days ago. Today, I received new photos of Gülümser and I wanted to share with you this beautiful little girl’s photo gallery. The first photo is so funny… she loves water! 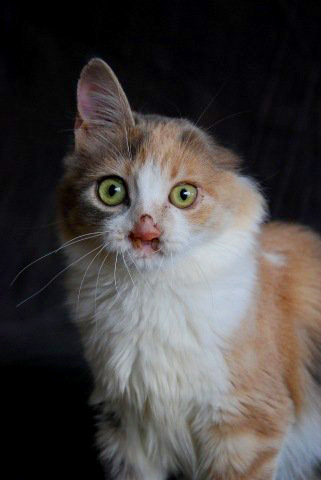 Though I have never met Gülümser, I am thankful to the rescuers — from Let’s Adopt! and the vet’s clinic to her new family — for giving her the support she needed to show all of us what she is truly made of. She’s really is beautiful! Here’s a link to her photo album, but be forewarned, there are some graphic images in this album. Hugs to YOU, Gülümser! You look mah-velous!!! And a shout out to Let’s Adopt! USA for their excellent post on the care and feeding of orphaned kittens. I too, think SHE IS BEAUTIFUL! I wish I could help all the lonely stray cats and love them all. But I could not do what you people do. Everyday I read stories and everyday my mind is blown by the love and strength these little felines have. Its just something miraculous to see or hear. My cats have saved me just as much as I have saved them. Idk where I would be with out them.Great job to everyone for having compassion for these soul savers. This cat and the story leapt out at me also. Amazing and beautiful. I feel for what this poor baby had to endure, but looks happy & healthy now. I hope whom ever is blessed to have this kitty treats it like a Queen. God Bless you for all you do!